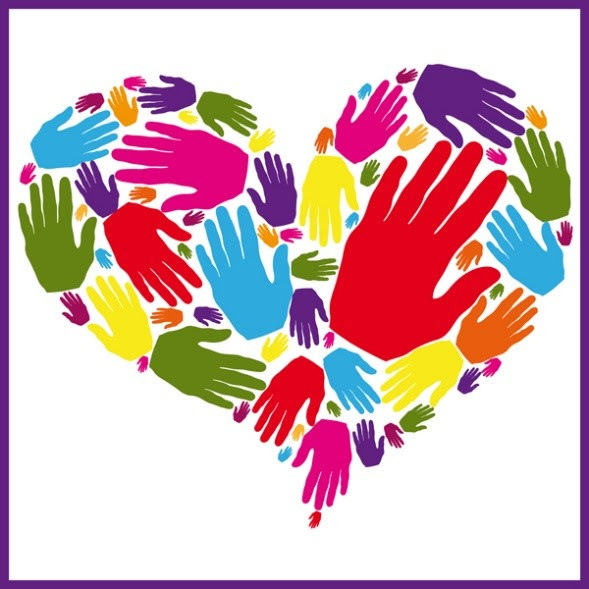 Thank you so much to all those who have completed the 'Hearts and Hands' poster forOpen House. 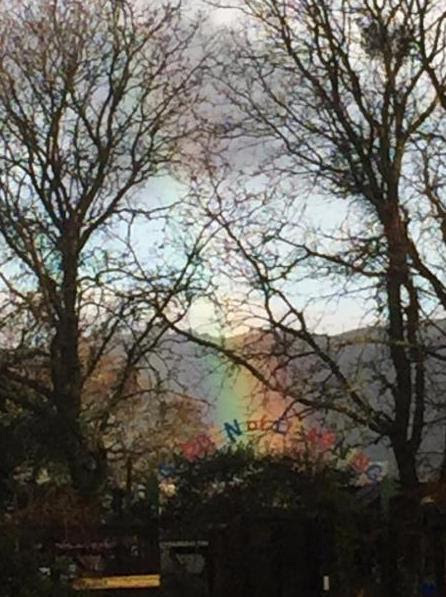 Your pictures and sentiments are an excellent testimony to our wonderful school! I am looking forward to seeing everyone at9:30Mass this Sundayfollowed byOpen House. Students are encouraged to wear aschool sweatshirtto show their school pride. We are excited to celebrate the hard work and accomplishments of our junior high students at ourScience Nighttomorrowevening!There are wonderful hands-on activities for our younger students, too!It's not too late to sign up for the Science Night dinnerhere.Final meal orders will be submitted this evening. I need to once again remind all of our parents aboutspeed on Hamlin Road and Sweet Drive.I took a call from a concerned neighbor who lives on Sweet Drive.Last Friday a car, with our 'Be The Good' magnet prominently displayed, actually sped around her car as she was approaching her home.This behavior sheds a negative light on St. Perpetua.Please be acourteous and responsible driveras you drive to and from our school. My God, I give you this day. I offer you, now, all of thegoodthat I shall do and I promise to accept, for love of you, all of the difficulty that I shall meet. Help me to conduct myself during this day in a manner pleasing to you. Amen. Science Night istomorrow!This event is forALL ages. Activities are designed for big and small! Siblings welcome. There israfflefor everyone who listens to our guest speaker at6pm! We still need parent volunteers to fill a few slots available for the 2nd shift, Hands-On Activities,7-8pm.You will receivedouble volunteer hours! We have finally received the master copy of theChristmas Sharing DVD.Copies have been ordered and should be available for salein two weeks.DVD cost is $12and we will make an announcement when they are available for purchasein the office(cash/check). Tomorrowis the last dayof theDennis Uniform winter sale!All items are15% off, and shipping is free with a $75 purchase. Now that the weather has turned cold, please make sure that your student has the appropriateschool uniform outerwear (fleece/sweatshirt/jacket)to wear while in the classroom. Non-uniform jackets can be worn outside for recess and lunch, butnotin the classroom.Please note thatrain-bootsarenotacceptable footwear for students. Our Annual Dinner Dance & Auction isMarch 25, 2017. We are already starting to gather fabulous items for the Auction. Thank you for your continued work on this! Attached is theDonation Letter and Formto use when requesting and collecting items. All completed forms can be submitted to Suzanne or Kim in the office. As a reminder, you may make an auction donation of Scrip cards.. It's a win-win ~ you contribute to the success of our auction and you also earn profit for your Scrip obligation! Simply order auction donation cards with your regular Scrip order and bring them to the office. 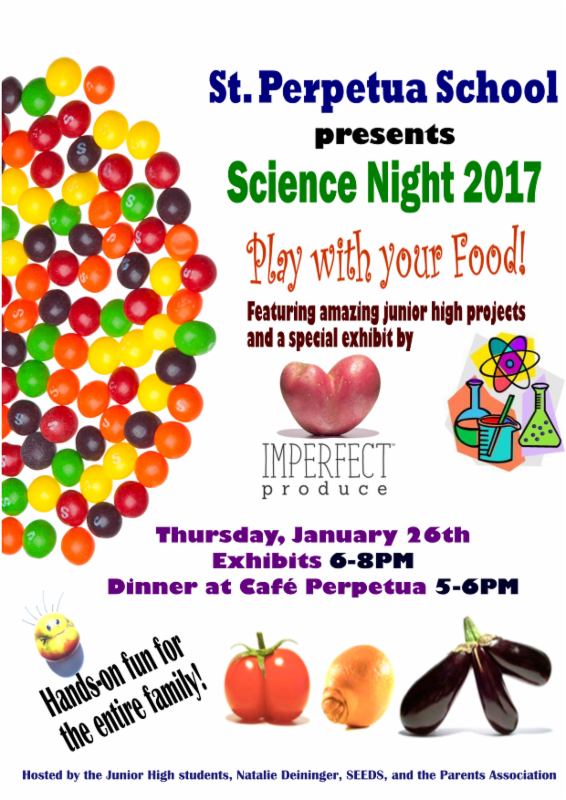 St. Perpetua Science Night Is Coming onJanuary 26th! Dinner will be catered by Lettuce Restaurant and served out of Cafe Perpetua.Here is thelinkfor Sign Up Genius ordering. We are extending the registrationdeadlineuntilthisFriday, January, 27so that we will have sufficient enrollment to run these classes. If you intend to have your child participate, please turn your registration into the office byFriday. Start thinking about yourFebruaryschedule.Download calendarhere. Please help out!We have many more openings todonate snackswithimmediate need. We rely on the parent community to keep costs down and our children fed after school.Remember that youearn service hoursfor your contribution. Sign uphere.Thanks in advance for your help. You need to plan on enough food for 65 thankful children. It was wonderful seeing so many of you at last week's Cafe` Perpetua! Thank you for braving the pouring rain! Your support and patronage are greatly appreciated! Please join us againthis Fridaywhere we will be featuring all of your favorites along with some new items such assavory bacon avocado muffins and triple berry cobbler! This Sunday is our Open House.After you have had an opportunity to visit your children's classrooms, please come up to theGarden of Learningto visit their other classroom! Please make sure your children visit the Garden under your supervision. The students have been busy planting winter veggies and flowers, sowing seeds, bringing in mulch, creating art for the garden, and so much more! I look forward to seeing you atCafe` Perpetuaon Fridayand inthe Gardenon Sunday! St. Perpetua's Annual Sweetheart Dance is coming! 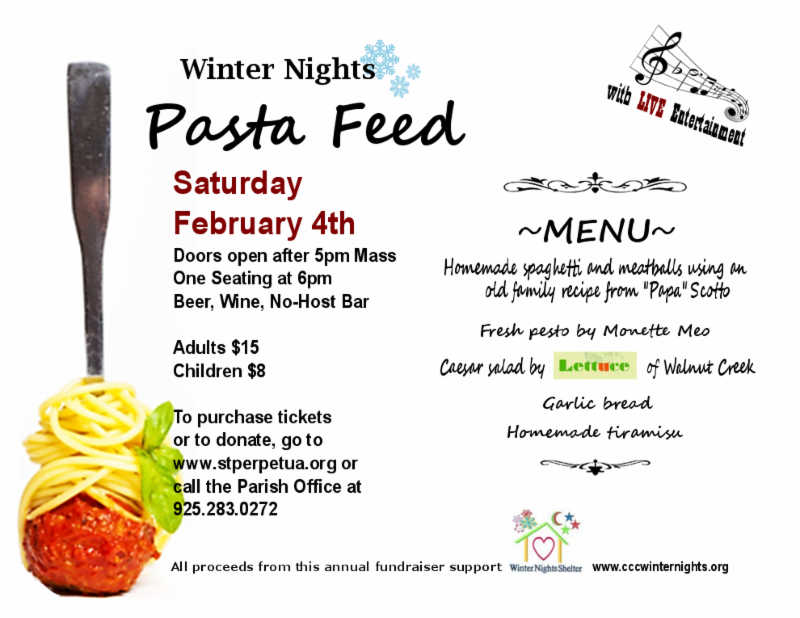 OurAnnual Pasta Feed fundraiserisSaturday, February 4. You can purchase the tickets online atwww.stperpetua.orgor download an order formhere. Tickets are $60 each and100% of all funds raised go to Bay Area charities. Tickets must be reserved and paid for in advance and are non-refundable. This is always a popular event, somake your reservation NOW by purchasing ticketshere. We are very proud of the success of the Scrip program. Families are actively using the program for family purchases, as well as donating to the 2017 auction. Thank you for your support! You can still order the full roster of Scrip cards with your weeklyonline ordersthrough thewww.shopwithscrip.comwebsite. You can pay by Prestopay, check or credit when you pick up your order.Whenever possible, please help us reduce credit card fees by paying via check. 2016 year end reportswill be coming homemid-February. Please contact me directly if you have any questions.